That’s what the forty engineers and IT experts in my Reinvent Yourself and Thrive course at UCLA Extension’s Technical Management Program said when I gave them their out-of-class assignment. Their homework was to make an unusual, strange, or ridiculous request of a total stranger where the odds of rejection were high. The results of that assignment were life-changing to many of my participants because they busted through a mental barrier that had stopped them from taking some real-world risks that could pay off in positive ways. I have seen far too many competent men and women restrict their behavior and avoid taking survivable risks because of internal censoring and disempowering self-talk. Whether it is speaking up more in meetings, asking someone for a date, or initiating an unpopular idea, we often stop because we imagine the pain of rejection and mentally magnify. Half of the class actually did the “rejection therapy” with both instructive and humorous results and reported their results. The next day Joe (changing all names here) asked a total stranger to give him $100. José asked the hotel valet if he could park cars for an hour. Mary requested her waiter at dinner to give her a foot massage. Luis asked the construction worker on the UCLA campus if he could operate the bulldozer. Fred asked a homeless man for some spare change. Sarah requested a free refill on the meat in her hamburger. Joseph pleaded with a well-dressed business guy to loan him his shoes for the evening. What was the learning lesson? It is so easy to stop ourselves from taking action, because of stories we make up in our mind, that we would get rejected, people would think badly of us, etc. In real life, for things that really matter, we often do the same thing. We create flimsy excuses in our mind not to go for things just to avoid the imagined pain. I challenge you to go out and get rejected today. Be respectful, don’t be creepy, but make a request that is so outlandish you’re guaranteed to get rejected. As the saying goes, whenever doesn’t kill you makes stronger. 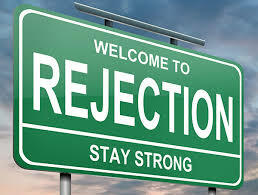 Knowing that you can handle rejection, strengthens your courage muscle, so its ready when it really counts. I’d love to hear your rejection story, post it below.